We expect geologic phenomena to occur on a geologic time scale. We expect these phenomena to be revealed on a time scale so vast that scientists must describe them in terms of their relationships to other major geologic milestones or paleontologic occurrences like mass extinctions, which have unfolded over the 4.54 billion year history of the Earth. Unless one has the good fortune, like Adam LeWinter and Jeff Orlowski, to witness and record a massive, lower-Manhattan-sized glacier calving in real-time (video below). Ice calving is the sudden cleaving of a mass of ice. The video shows the calving of the Jakobshavn Glacier in western Greenland during 2008. For 75 minutes, the glacier retreated a full mile along a calving face estimated at 3 miles in length. The footage is featured in the film Chasing Ice. For a sense of the size of the calved ice, the film producers likened it to the entire lower tip of Manhattan Island breaking off. 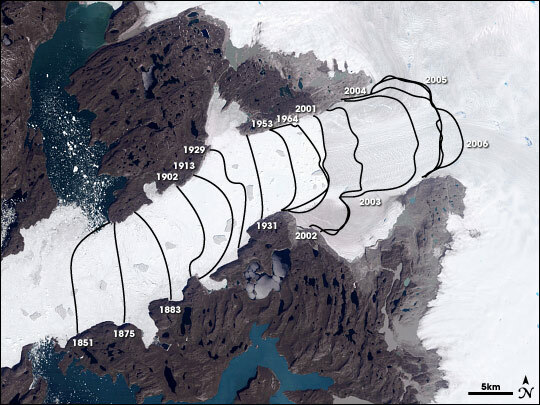 Scientists have recorded the steady retreat of the Jakobshavn Glacier since 1851 (NASA satellite image below). "A man who keeps company with glaciers comes to feel tolerably insignificant by and by. The Alps and the glaciers together are able to take every bit of conceit out of a man and reduce his self-importance to zero if he will only remain within the influence of their sublime presence long enough to give it a fair and reasonable chance to do its work." — Mark Twain, from A Tramp Abroad, p. 466. Geologists have divided the 4.54 billion year history of the Earth into a hierarchy of supereon, eon, era, period, epoch, and age. Calving of the Jakobshavn Glacier has been recorded in modern history since 1851 The 2008 calving occurred in a matter of minutes. Largest glacier calving ever caught on film, EarthSky. Feb 5, 2013. Geologic Time - Earth's History - University of Oklahoma Earth System Science Education. A Tramp Abroad. Mark Twain, 1880.